Housed in a Victorian-era biscuit factory in the middle of Woodstock, Cape Town’s Old Biscuit Mill now houses day and night markets where local and traveling foodies flock to sample some of the city’s best bites. On any given day, the market teems with diners and shoppers enjoying the mill’s many restaurants and designer shops, but it’s on Saturdays that things really get lively. 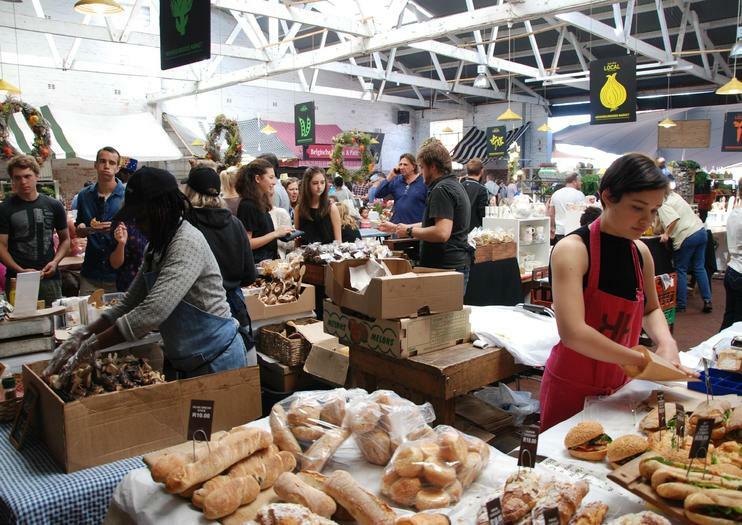 Each Saturday the Neighbourgoods Market takes over the Old Biscuit Mill, with more than 100 local vendors selling craft food, organic produce, artisanal chocolate, beer, cheese, clothes and crafts, all to the sounds of live music. Hungry travelers will find one of the world’s best restaurants, the Test Kitchen, inside the Old Biscuit Mill, as well as the slightly more budget-friendly Pot Luck Club. While the Old Biscuit Mill is closed on Sundays, some of the restaurants within remain open. The Saturday Neighbourgoods Market is open from 9am to 2pm. Come ready to eat, drink, and be merry on this full day “makers” tour, where you’ll experience some of the best artisan goods in town. The day begins with a visit to a local coffee shop, followed by an indie clothing store, a craft distillery, and several microbreweries. You’ll also visit Old Biscuit Mill market, where you can shop for all manner of goods and souvenirs. Explore two colorful South African food markets with this tour from Cape Town. Visit the Oranjezicht City Farm Market and the Neighbourgoods Market in the Old Biscuit Mill. Learn about the produce and food items grown locally and sold at these markets. Buy any goodies that pique your interest. Food Jams started in 2010 with a group of friends who wanted to learn how to cook. Instead, Jade invited them to a cooking party, based on the idea of music jamming, but in her parent's kitchen.Fast forward 9 years and we're jamming up a storm, every day, twice a day.We host any celebration you can think of! From visits to Cape Town to learn about local & indigenous food whilst having a cooking party, to happy birthdays to team buildings, supper clubs, kids parties, bachelorettes, weddings, student jams, social jams and MasterChef challenges. Explore the cutting edge of South African creativity – where art, architecture & design intersect. See the country’s highlights, hidden gems & iconic sights – in summer. Meet local trail blazers who stretch the powers of innovation, engage with enlightening experts. Enjoy privileged access, seminal art collections & enlightening museums on curator-led tours.Discover how design, art & craft are providing a third way between entrepreneurship & aid.In Cape Town, take in its spectacular beauty as well as the Cape Town Art Fair – a transcontinental showcase In the Winelands, visit private art collections, sculpture-filled gardens set among unique Cape Dutch architecture with some independent time in Franschhoek (a foodie capital). In Johannesburg, get a taste of the cosmopolitan mix & standout shops. Appreciate democracy at work. Celebrate in the Cradle of Humankind, a World Heritage Site.Opt for a safari to see the ''Big Five'' up close and personal at the start of the trip.